Blog / TRINUS wins 2017 “BUSINESS OF THE YEAR” Award!! 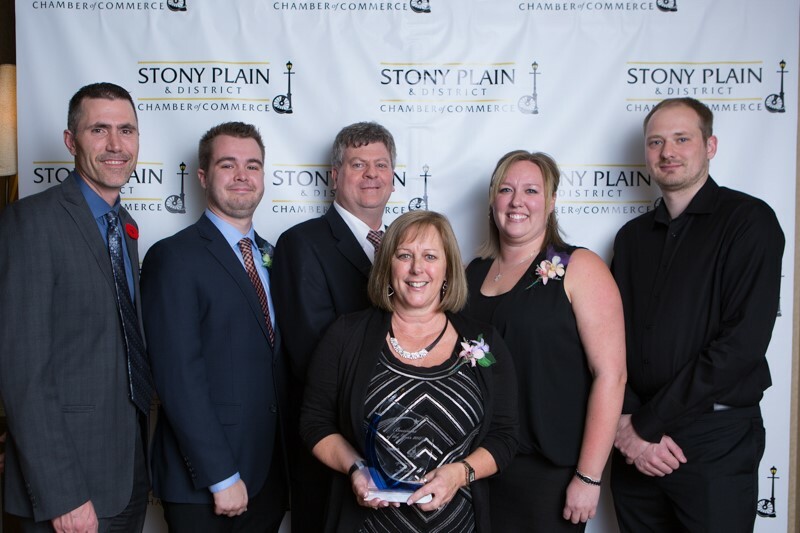 The Stony Plain & District Chamber of Commerce held their annual Business Awards Gala at the local Best Western Hotel, on November 4th. This year, TRINUS was nominated for and won the 2017 “BUSINESS OF THE YEAR” Award!! This is the most prestigious and coveted prize that any Stony Plain business can win and we are very honoured to have been recognized in this way. Criteria for this amazing milestone in our company’s history include: Community Engagement, Excellence in Customer Service and Growth over the last year. TRINUS strives to excel in these areas (as well as in everything else we do), and it is all because of the hard work the entire company has put in over the last 20 years, since its’ foundation. From left-to-right: Award Presenter Mark Radke (SERVUS Credit Union), together with TRINUS’ Kevin White, Chris Penn, Sharrell Jespersen, Linda Jespersen, and Mike Jettkant.